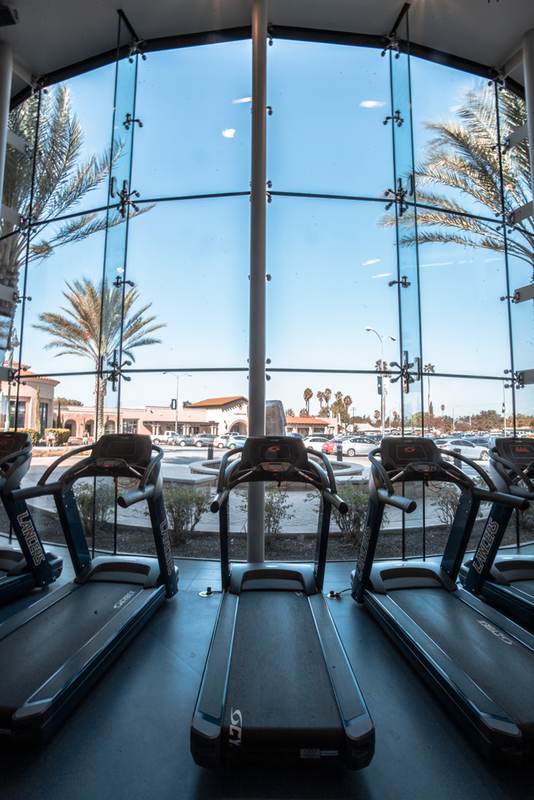 The Recreation Center at California Baptist University put up “We’re sorry for our dust” signs over the summer and began a long-awaited expansion. 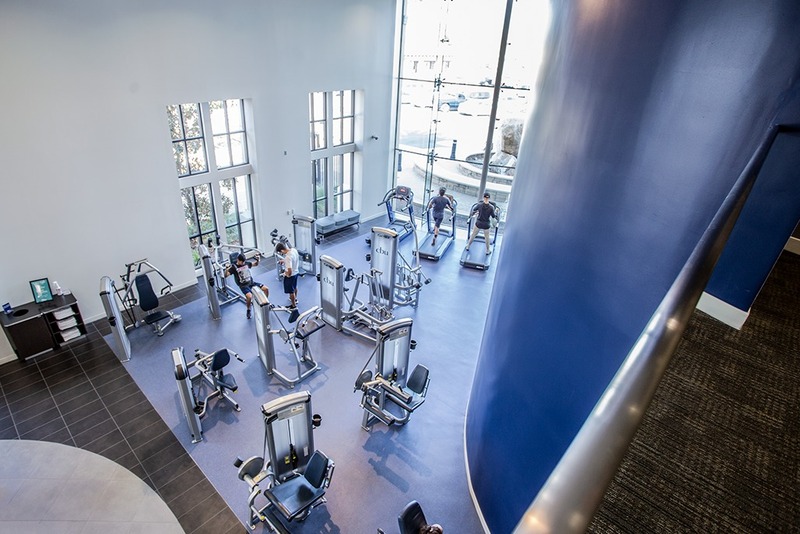 The Rec Center is adding diversified gym equipment and creating more space to work out. The first phase has already begun and has completed the addition of some redesigned spaces and new pieces of equipment. 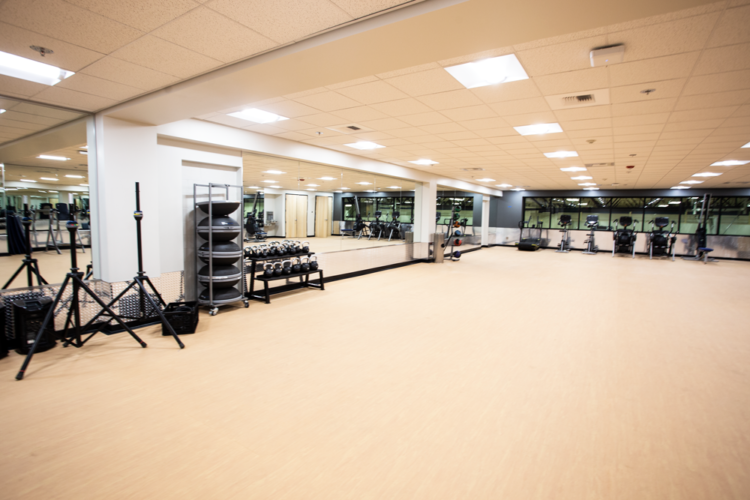 The space where a rock climbing wall once stood is now a circuit training area with nine treadmills, along with various plate-weight machines organized according to what area of the body the workouts target. Danielle Lutjens | Runners get to experience a great new view as the treadmills relocate to the front of the Rec Center facing an outlook towards campus. 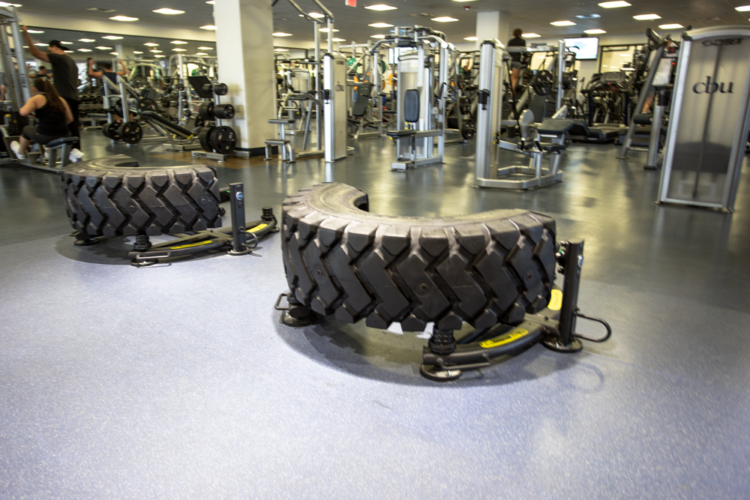 Additionally, the Recreation Center also has a new 180-tire flip machine, which simulates flipping a tire, and a Skill Mill self-powered treadmill, which allows for sled pushing and running at a more controlled pace. Six new rowing machines also have been installed. These machines allow the user to do heavier, weighted rows or lighter rows that focus more on cardio. Danielle Lutjens | New editions to the rec center include two weighted half-tires, perfect for tire flipping. The center will soon install six new Olympic half-racks, featuring Olympic bars with bumper plates, along with new rope machines. The gym expanded its floor space by removing the former employee break room on the first floor and adding another set of benches and dumbbells. The new weight racks have dumbbells up to 120 pounds. These new areas also keep congestion down in the free-weight area because participants have more room to spread out. Nick Cortz, junior English major, said he likes the new spaces and the freedom it gives him to work out whenever he wants to without having to wait for machines. “I like the extra space, especially since there is now room for me to get in a full, functional workout,” Cortez said. These upgrades are not the end of the expansion project. On the second floor, the center will feature a fitness suite with ab machines, mats and a Life Fitness Synergy 360 XL. Danielle Lutjens | Banner | Kendall Kholenburger, sophomore early childhood studies majors, develops a new routine at the Recreation Center, which is currently undergoing renovations to install new equipment and rooms. Joe Fix, fitness coordinator of the Recreation Center, said Synergy 360 will be an impressive piece of equipment. The center will also feature three new group exercise rooms, and an improved basketball and volleyball court, Plummer said. Additionally, two new rooms will be added to the second story in the Recreation Center. One of them will be a cycle room and the other will feature boxing equipment, TRX and battle-rope. Danielle Lutjens | The upstairs has also undergone new renovations with a new back room available for a diverse amount of workouts. Parker Schnetzler, junior biology major, said he is excited to see the Recreation Center introduce more equipment and to have more space to work out. The staff of the Recreation Center asks that students be patient as the space undergoes these renovations, but Plummer said she expects the changes to be beneficial and worth the wait. With more space and equipment, students can expect diversified workouts and a better workout experience at the Recreation Center. The upgrades are set to be completed by August 2019.